When Netherlands-born Robbert Flick first moved to Los Angeles in 1968, the car-centric nature of the sprawling American city immediately influenced his photographic practice. Between 1977 and 1979, he photographed no other landscape than the multi-level parking garage located behind his Inglewood studio. Arena, the resulting series of this dedicated two-year study, is a conceptual counterpoint to the exhibition The Shape of Speed, demonstrating the starkly complex and beautiful systems that support car culture. Devoid of both cars and people, Flick’s black-and-white photographs treat the parking structure as a system of lines, angles, masses, planes, and contrasts. 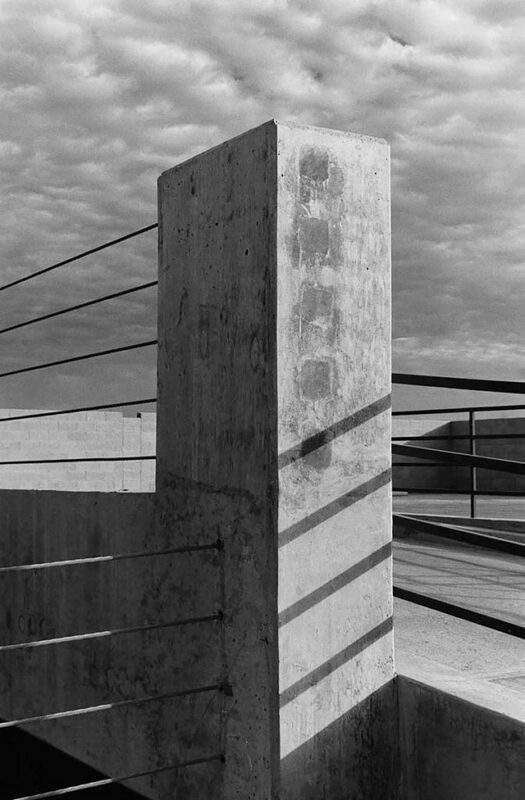 Weighty concrete engages with sinuous steel cables, while the strong California sun casts severe shadows on the vertical and horizontal surfaces, occasionally assisted by bare fluorescent lights. Far from a dull description of a garage, the Arenaseries encourages even the most jaded of car commuters to pay close attention to the modern functional architecture that surrounds us all. Organized by the Portland Art Museum and selected from the collection of the Wilson Centre for Photography. Curated by Julia Dolan, Ph.D, The Minor White Curator of Photography.